MARTALINE, Haras de la Reboursière & Montaigu, France. Prix Maurice de Nieuil (Gr.2 - 14 f), Maisons-Laffitte, beating Gr.1 winner Westerner, Cléty and Zindabad. Raceform : "He accelerated easily into the lead and went on to win with something in hand." Racehorses of 2003 : 118 "strong, good-topped colt ... consistent." First year at stud in 2005. By LINAMIX (1987 - 2016). Group I winner in France. Poule d'Essai des Poulains (Gr.1), Prix La Rochette (Gr.3), de Fontainebleau (Gr.3), 2nd Champion Stakes (Gr.1), Grand Critérium (Gr.1), Prix Jacques le Marois (Gr.1), du Moulin de Longchamp (Gr.1). 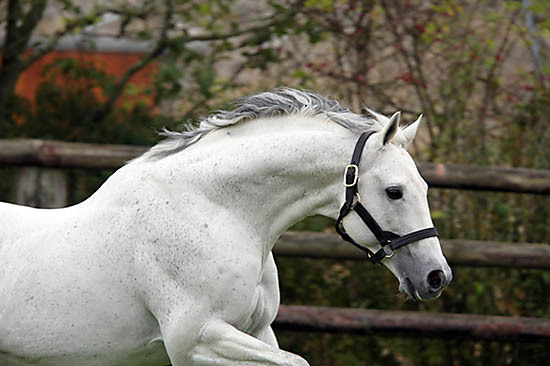 Leading Sire in France. 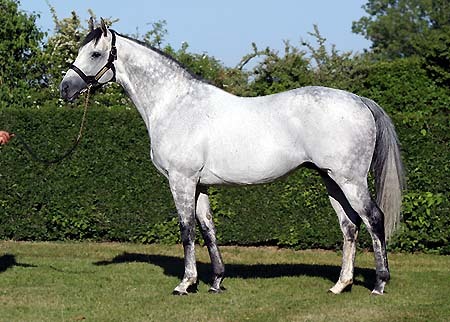 Sire of 73 Stakes winners (42 group winners). - REEFSCAPE (Linamix - 2001), 5 wins at 3 and 4, Prix du Cadran (Gr.1), Hubert de Chaudenay (Gr.2), Gladiateur (Gr.3) at Longchamp, de l'Avre (L.), du Connétable at Chantilly, 2nd Ascot Gold Cup (Gr.1), Prix Ganay (Gr.1), Royal-Oak (Gr.1), de Lutèce (Gr.3) at Longchamp, Kergorlay (Gr.2), de Reux (L.) at Deauville, 3rd Coronation Cup (Gr.1) at Epsom, Prix Vicomtesse Vigier (Gr.2), de Barbeville (Gr.3) at Longchamp, 4th Prix du Cadran (Gr.1), Right Royal (L.), 5th Grand Prix de Saint-Cloud (Gr.1), 6th Hong Kong Vase (Gr.1) ; 1 win in jumping races. 660 041 euros. Sire. Picture. - Diamond Reef (Alzao - 2002). Dam of Well Tried (c. Three Valleys), 3rd Prix de Belleville at Longchamp. - COASTAL PATH (c. Halling - 2004), 6 wins, Prix Chaudenay (Gr.2), Vicomtesse Vigier (Gr.2), de Lutèce (Gr.3), de Barbeville (Gr.3) at Longchamp, de la Pointe du Hoc at Clairefontaine-Deauville, de Troarn at Deauville, placed three times, 2nd Prix d'Hédouville (Gr.3) at Longchamp, 3rd Ascot Gold Cup (Gr.1), Prix Kergorlay (Gr.2) at Deauville, 319 065 euros. Sire. - Crystal Reef (f. King's Best - 2005), 2nd Prix Hildegarde at Saint-Cloud, 3rd Prix d'Hotot-en-Auge at Clairefontaine-Deauville, de la Meurthe at Nancy. Dam of DOHA DREAM (c. Shamardal), Prix Chaudenay (Gr.2) at Chantilly, Derby de l'Ouest (L.) at Nantes, Prix Frédéric de Lagrange (L.) at Vichy, des Trois Massifs at Fontainebleau, des Orfèvres at Saint-Cloud, 2nd Grand Prix de Deauville (Gr.2), Prix de Reux (Gr.3) at Deauville, de Barbeville (Gr.3) at Longchamp (18), Coupe des 3 Ans (L.) at Lyon-Parilly, Prix de la Sorbonne at Longchamp, 3rd Prix Niel (Gr.2) at Chantilly, 5th Grand Prix de Chantilly, Sire ; MEHZAM (g. Exceed And Excel), Prix de l'Adour at Tarbes (17), du Vexin normand at Deauville (17), 2nd Prix de la Haie Tondue (18), de Livarot (18), des Manoirs (19) at Deauville, d'Ousse-Suzan at Mont-de-Marsan (17), de la Mare Madame at Chantilly (19), 3rd Prix du Panthéon at Longchamp (18) ; MATFOG (g. Style Vendôme), Prix du Centre d'Ecotourisme de Franchard at Fontainebleau (18), 2nd Prix Le Haar at Saint-Cloud (18) ; in jumping races, Prix du Casino de Royan at Royan (18), 2nd Prix des Platanes at Auteuil (18). - BEAT HOLLOW, 7 wins, Arlington Million (Gr.1), Manhattan Handicap (Gr.1), Grand Prix de Paris 2000 (Gr.1), Turf Classic (Gr.1), Newmarket St. (L.), 2nd Eddie Read Handicap (Gr.1), Explosive Bid Handicap (Gr.2), 3rd Derby St. (Gr.1), Keeneland Turf Mile St. (Gr.1), Sire. - Brightest, placed in France. Dam of GLOWING, 3 wins, Brownstown St. (Gr.3), brood mare ; THE ANVIL, Maiden St. at Dundalk (17), 2nd Royal Lodge St. (Gr.3), 3rd Autumn Stakes (Gr.3), Chester Vase (Gr.3) (17). Sire. - Biloxi, unraced. Dam of 2 winners, and also dam of Benelux, unraced, dam of DUCK FEET, 4 wins, Premio Guido Berardelli (Gr.3). - OASIS DREAM, 4 wins, July Cup (Gr.1), Nunthorpe St. (Gr.1), Middle Park St. (Gr.1), 2nd Haydock Sprint Cup (Gr.1), Leisure Sprint Cup (Gr.1), 3rd King's Stand Stakes (Gr.2), Sire in England. - ZENDA, 3 wins, Poule d'Essai des Pouliches 2002 (Gr.1), 2nd Coronation Stakes (Gr.1), Queen Elizabeth II Challenge Cup (Gr.1). Dam of REMOTE, Tercentenary St. (Gr.3) ; KINGMAN, Irish 2000 Guineas (Gr.1), St James's Palace Stakes (Gr.1), Sussex Stakes (Gr.1), Prix Jacques le Marois (Gr.1), Solario St. (Gr.3), Greenham St. (Gr.3), 2nd 2000 Guineas St. (Gr.1), Sire. - CINNAMON BAY, 3 wins, Prix d'Angerville (L.), de la Prairie at Chantilly, 2nd Prix Urgence at Saint-Cloud, 4th Prix de Bagatelle (L.) at Maisons-Laffitte. Dam of NEW BAY (c. Dubawi), Prix du Jockey-Club (Gr.1) at Chantilly, Guillaume d'Ornano (Gr.2) at Deauville, Niel (Gr.2), Machado at Longchamp, Gontaut-Biron (Gr.3) at Deauville, 2nd Poule d'Essai des Poulains (Gr.1) at Longchamp, de Trossy at Chantilly, 3rd Prix de l'Arc de Triomphe 2015 (Gr.1) at Longchamp, 4th Irish Champion Stakes (Gr.1) at Leopardstown ; SPICE TRAIL (f. Champs Elysées), Prix Ad Altiora at Saint-Cloud, 3rd Prix Roselière at Clairefontaine ; PHARAONIC (c. Dansili), Prix Antivari at Saint-Cloud, 2nd Prix de Laigneville at Chantilly (17), Casterari at Saint-Cloud (17), 3rd Prix de Gruchy at Deauville (17), Nasrullah at Saint-Cloud (17). - EILEEN JENNY (Kris), 2 wins, Premio Giovanni Falck (L.), 3rd Irish Oaks (Gr.1), Meld St. (Gr.3), Lapis St. (L.). Dam of 2 winners. - KASMAYO (Slip Anchor), 2 wins, Troy St. (L.). Sire in Ireland. - Ezy Koter, 2 wins, 2nd EBF Ulster Harp Derby (L.). Sire. - Woodwin, 1 win, 3rd 1 000 Guineas Trial St. (L.). Dam of 4 winners. - Pirie. Unraced. Dam of DECADO, 4 wins, Tetrarch St. (Gr.3), International St. (Gr.3). - West China (Habitat), 3 wins, 2nd Johnny Jones Trial Stakes (L.), 3rd Ormonde Stakes (Gr.3). Sire in Ireland. - SORB APPLE (Kris), 1 win in England. Dam of 2 winners. ARCHANGE D'OR, LITERATO and NO RISK AT ALL.